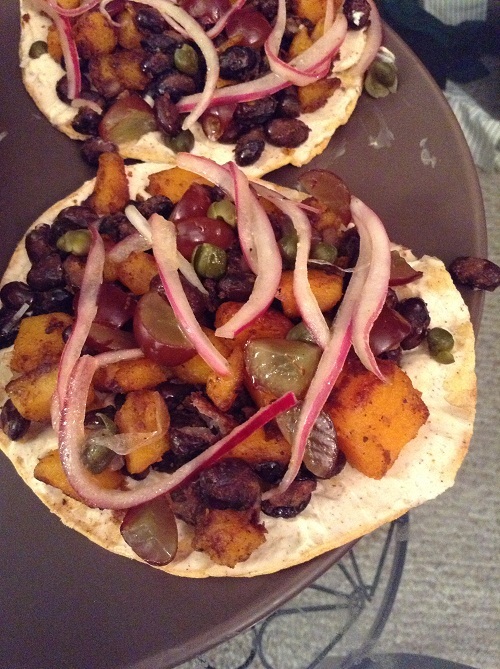 I’ve been really into Pinterest recently, especially the food and recipe section and recently pinned a delicious looking recipe for a black bean and butternut squash tostada. I also recently had an absolutely delicious meal at one of my favorite neighborhood restaurants, The Peasantry. One of the dishes I had was their butternut squash flatbread, which was absolutely amazing. The Peasantry is known for their "elevated street food" taking traditional street food recipes like gyros and kebobs and making them "fancy" in a sense. I really love when restaurants are able to create unique dishes that are packed with a ton of flavor, but not a lot of extra fat and calories. I’ve been trying to cook with a lot more spices recently, and have also gotten into pickling. So I decided to create my own tostada/flatbread combo inspired by the flavors from both recipes! One of the goals of this recipe was to create a unique flavor by combining, sweet, savory, salty, and tangy. And according to TT#1 the recipe came out just the way I had hoped!